—from a log cabin to the White House! Abraham Lincoln was born in Hardin County, Kentucky on February 12, 1809. At that time, Kentucky was on the frontier—settlers were moving westward into the Ohio and Kentucky region; the Ohio and Mississippi Rivers were the highways for commerce as small farms grew up and towns developed. The Lincoln family moved to nearby Knob Creek Farm in 1811 when Abraham was two, and then in 1816 further west to Pigeon Creek, Indiana, where he spent his formative years. 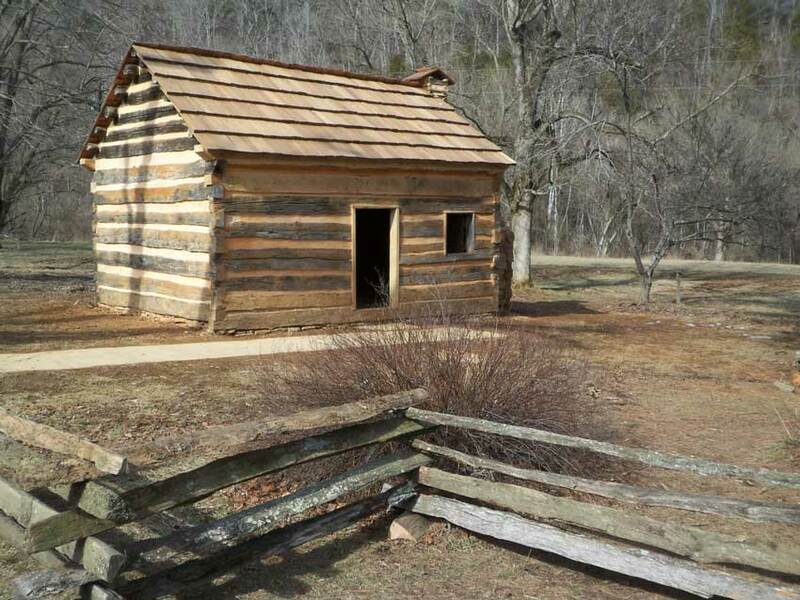 Abraham Lincoln's boyhood home at Knob Creek (above) is presently a National Historical Landmark administered by the National Park Service. As a successful farmer and carpenter, his father was respected in Pigeon Creek community. His father had remarried because Lincoln's birth mother had died after having some bad milk. So, it was his stepmother that recognized and encouraged young Abraham in his self-education, even though he was working for his father outdoors doing chores around the farm and for others in the community. Abraham was known for his immense strength and ability to use an axe. However, it was his thirst for knowledge and reading that propelled him into law and eventually into politics. As an 1860 presidential candidate (left), Abraham Lincoln ran on the antislavery platform of the newly established Republican Party. 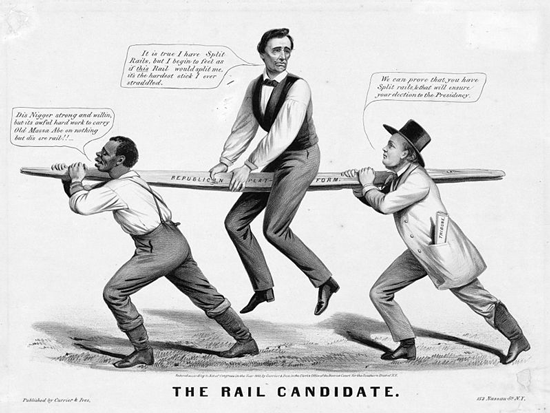 In the political cartoon below published by Currier and Ives September 1860, the political artist Louis Maurer has drawn Lincoln being carried on a wooden rail of a split-rail fence, which is aptly titled the Republican platform. He is shown being carried in front by a black man and in back by Horace Greeley, the highly acclaimed editor of the New York Tribune and vehement abolitionist; both represented the RepublicanParty's anti-slavery position. Greeley is shown saying,"We have proven you have split rails, and that will ensure your election to the Presidency." Lincoln's nickname was "rail splitter!" The split rail fence metaphor alluded to the candidate being from the countryside and not part of the Washington city politics, and he would be the candidate to represent hard-working common people. 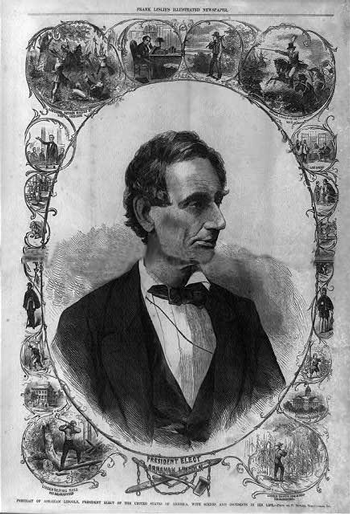 President-elect Abraham Lincoln is depicted in Frank Leslie's News by earlier events in his life, from wilderness experiences to law and politics. Abraham Lincoln was called the “Black Republican” and became quite popular even though the Secession Crisis grew and divided the nation. Lincoln, the first national candidate for the relatively new Republican Party, was victorious in the election of 1860 even though he was not on the ballot in ten southern states. They saw Lincoln as being a radical, taking them where they didn't want to go; secession was their last option. Lincoln became the sixteenth elected president when the Civil War began, and throughout the war, he sought to reunify the nation. Some people and former supporter and newspaper publisher Howard Greeley thought that Lincoln was not doing enough about slavery. President Lincoln responded to his critics when he stated his position 22 August 1862 letter to the New York Tribune (Greeley): "My paramount object in this struggle is to save the Union, and is not either to save or destroy slavery. If I could save the Union without freeing any slave, I would do it; and if I could save it by freeing all the slaves, I would do it." Both Lincoln's election and his antislavery views have been seen as causes of the Civil War. However throughout the Civil War, President Lincoln maintained his focus on the nation's reunification. 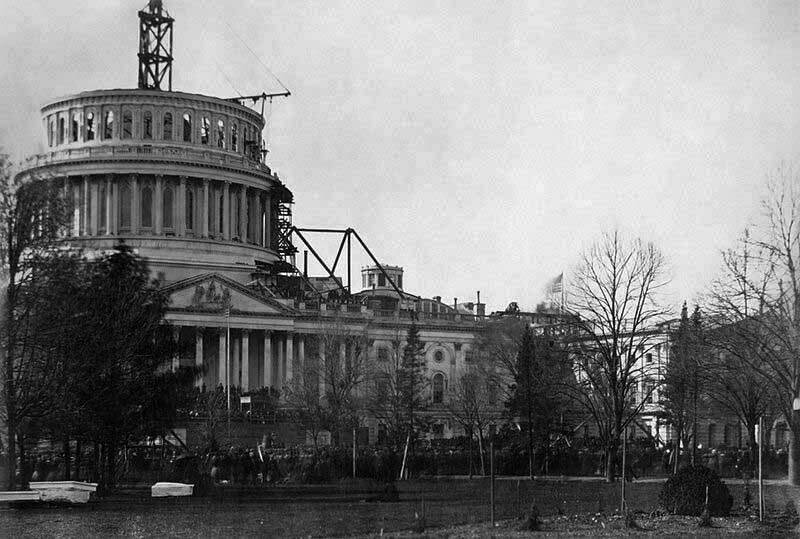 The U.S. Capitol was under construction when Abraham Lincoln was inaugurated in 1861 in Washington, DC. In this morning shot, crowds are shown gathering in front of the Capitol's steps where Lincoln is to be sworn in. Fanciful copies of the Emancipation Proclamation were made to distribute to the general public. The images around the edges illustrate the life of a slave, from capture to freedom. There are only twenty-six known copies from a special 1864 printing of the Emancipation Proclamation that Lincoln signed as part of a fundraiser for the Great Sanitary Fair in Philadelphia. 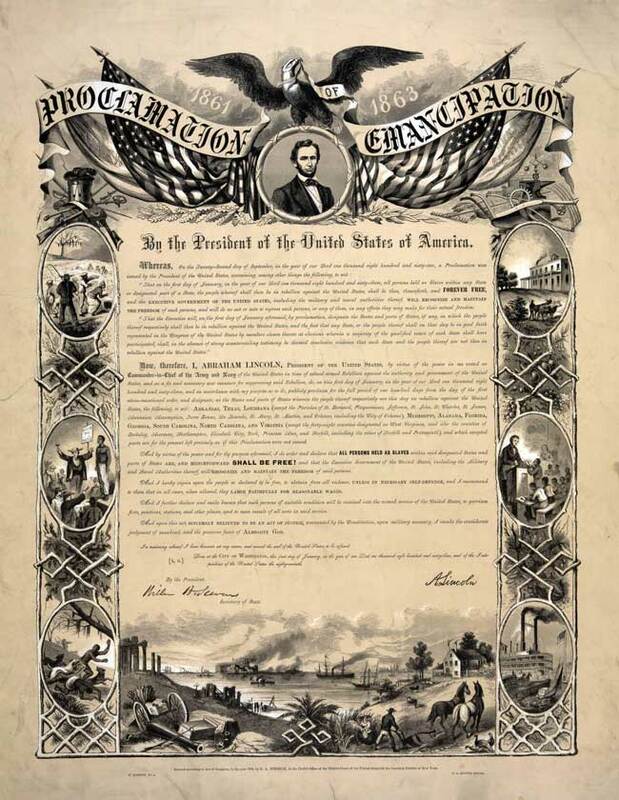 Lincoln's Emancipation Proclamation (above) was an executive order issued January 1, 1863 that freed slaves in the ten rebellious states. 1862 had been a bad year for the Union Army. Several battles were lost, and England had made overtures that the South would win. Under Robert E. Lee the Confederates were winning battles. Indeed of the Seven Days battle in July, the Confederates were overpowering most of the time. Yet George McClellan had shown a reluctance to attack; he rationalized his situation not as much as losing, but rather failing to win. Lincoln had to do something to rally the North and wanted to change the perspective. Small Union victories along the southern coast had led to many southern plantation owners abandoning their properties and leaving hundreds of slaves. Lincoln pictured the creation of a new Union formed on emancipation, or the freeing of slaves, rather than simply recapturing and rebuilding the old Union. On July 22, 1862, Lincoln called a cabinet meeting to tell them he was going to emancipate the slaves. To keep his respectability, he agreed not to announce the emancipation until the Union had a victory; although considered a draw, Lincoln considered Antietam enough of a victory only because Lee withdrew from the battlefield. The Emancipation Proclamation changed the character of the war from states rights to slavery. It also allowed blacks to enlist and fight in the Union Army. Some legislators believed the Emancipation Proclamation would be seen as a temporary war time measure. Although slavery had ended, it was not yet legally abolished. For that to happen they needed the passage of the proposed 13th Amendment to the Constitution; though it had passed the Senate in 1864, it did not make it through the House of Representative. So, Lincoln made part of his 1864 re-election platform. Lincoln was re-elected in 1864 and took office January 1st, 1865. The 13th Amendment narrowly passed the House on January 31st and signed into law by Lincoln. The surrender at Appomattox followed on April 9th. And then, on April 15th, Lincoln was assassinated. The assassination of President Lincoln occurred just as the war ended. 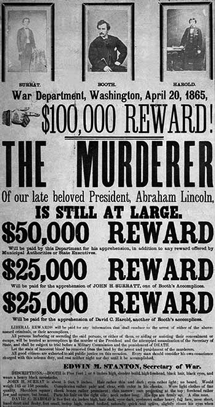 Lincoln was shot by John Wilkes Booth at Ford's Theater in Washington, DC, and died April 15, 1865. Lincoln is honored in history for his wisdom, justice for the common man, and dedication to God and country during a time of national crisis. Indeed, his Gettysburg Address, which was delivered in November 1863 in dedication of the national cemetery to honor fallen civil war soldiers from the Gettysburg battle, stands out as a speech directed to the whole nation. 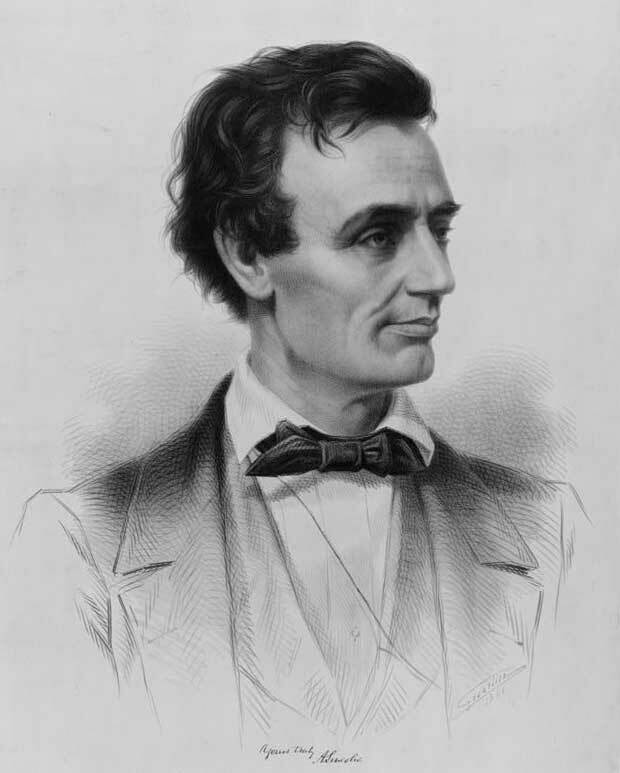 The Joint Resolution of Congress dated April 17, 1865, contained these words: "Whereas Abraham Lincolns originality of manner, his humor, wit, sarcasm, and wondrous powers of ridicule, were weapons peculiarly his own, which no one else could imitate. Add to these qualities courage, will, and indomitable persistence of purpose, which never flagged or faltered, and he was a power felt and acknowledged by the nation. Take him all in all, it will be long ere we look upon his like again."